The primary emblem of the feminine in Tibetan Buddhism is the dakini, or "sky-dancer," a semi-wrathful spirit-woman who manifests in visions, dreams, and meditation experiences. Western scholars and interpreters of the dakini, influenced by Jungian psychology and feminist goddess theology, have shaped a contemporary critique of Tibetan Buddhism in which the dakini is seen as a psychological "shadow," a feminine savior, or an objectified product of patriarchal fantasy. 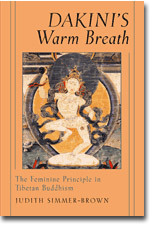 According to Judith Simmer-Brown--who writes from the point of view of an experienced practitioner of Tibetan Buddhism--such interpretations are inadequate. In the spiritual journey of the meditator, Simmer-Brown demonstrates, the dakini symbolizes levels of personal realization: the sacredness of the body, both female and male; the profound meeting point of body and mind in meditation; the visionary realm of ritual practice; and the empty, spacious qualities of mind itself. When the meditator encounters the dakini, living spiritual experience is activated in a nonconceptual manner by her direct gaze, her radiant body, and her compassionate revelation of reality. Grounded in the author's personal encounter with the dakini, this unique study will appeal to both make and female spiritual seekers interested in goddess worship, women's spirituality, and the tantric tradition.